We set off after breakfast knowing this was our last chance of storms for this trip and also knowing the models were not being too kind with regards to storms. Moisture had still not returned to the area sufficiently with only Mid 50’s dewpoints at Douglas after some mixing of the air that morning. 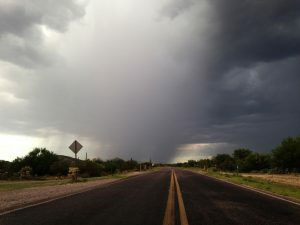 Storms would roll into extreme SE Arizona from SW New Mexico and would come up against more unfavourable conditions the further west they went. In fact most models had Arizona devoid of convection by 6pm. We got onto our first Storm near the town of San Simon which was throwing out a huge dust storm in all directions. Lightning was hard to see and buried by the sand and dust. 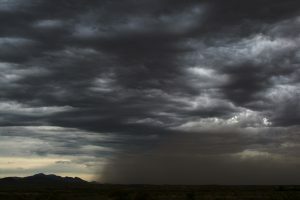 The picture below is looking north from I-10 of the Haboob marching West towards the Catalinas. We blasted east after this to get into the precipitation area of the storm and started to see much more Cg Lightning but just could not find a suitable dry stopping point to try to shoot lightning on our cameras. 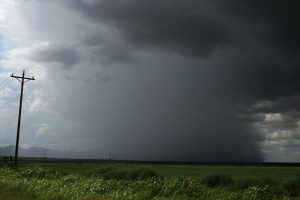 The storm then promptly died and pretty much everything dried up and it was only 4pm! It was a pretty lame end to our Monsoon Season Journey tbh. On the way back to Tucson we were treated to the best Sunset of the trip though so maybe Arizona was saying goodbye in Style before we set off in the morning for Denver and the Eclipse! Amazing Sunset Colours on the Mountains Above! 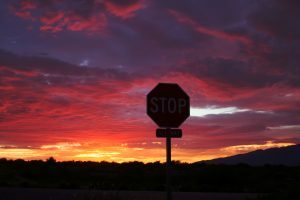 A fitting end to the Monsoon Season above with Arizona simply saying STOP! 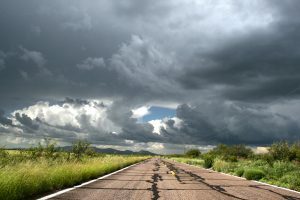 See you next year hopefully Arizona and here is too many more Monsoon Storms and Fantastic Scenery! We left Flagstaff early for our 2 hour trip North to Page making sure we got to our organised trip to the Secret Canyon by 9am, this would have been impossible from Phoenix and was why we stayed North last night. 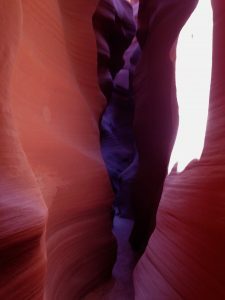 The tour was of the many Slot Canyons they have in this part of Arizona, carved by wind and rain over centuries and you are left with amazing sandstone canyons. The 30 minute Sand Dune buggy ride with our guide Nick was also worth the money alone cutting through dry riverbeds on the way. The Slot Canyons were stunning, will only put 1 picture up here but if you are ever in Arizona these are a must see! After lunch we headed about a mile down the road to visit the famous Horseshoe Bend part of the Grand Canyon on its Eastern Rim. And again this viewpoint was breath taking looking into the canyon from 1000 feet above. This attraction is free of charge but is quite a hike in temperatures of 95f! Storms are forecast for Saturday (Last Day of the Monsoon part of the trip) so it will be a welcome sight to get back into storm chasing again, the one down side is the area most affected is where we have been for the last 10 days and SE Arizona once again! 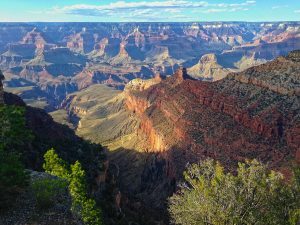 With this being the 2nd of 4 down days in the break mode we started our shift North to visit the Grand Canyon a bit more extensively and also to stay in Flagstaff for the evening in readiness for the Page area the next day. We left at breakfast time and got to the South Rim just after lunchtime. We stopped at numerous viewpoints today getting some nice views. With much lower temperatures and no moon in the night sky the journey on towards Flagstaff was going to be a good one for astro photography and we noted a lovely view over a couple of Volcanoes on the way up which would have the Milky Way perfectly set above them and so we stopped for about an hour on the way back. 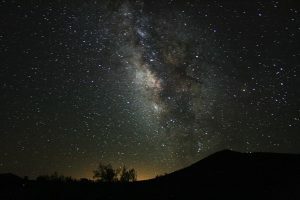 This is the most stars I have ever seen in Arizona in crystal clear skies and even my cruddy camera at F3.5 and ISO 1600 managed to pull off some decent shots of the galaxy we are in! Today was the first of 4 down days so we took the decision to do the touristy stuff around the Sedona area and the ghost town of Jerome. The day afforded me another great viewpoint for later trips around the Mogollan Rim from the town of Jerome which was duly noted on the map. After leaving Jerome and heading back to Phoenix we stopped off at Sunset Point for a rest and was taken aback when a visitor wanted to watch the sunset with us. 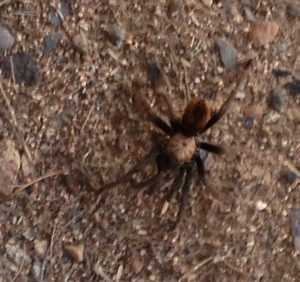 This was the closest I have ever been to one of these and probably wont get as close as this ever again, but he seemed friendly enough. 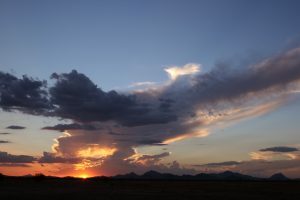 Today would be the last day of storms before the Monsoon season goes on a 4 day Break pattern with super dry air intruded the whole of Arizona from the west. In fact dewpoints would drop as low as the mid 20’s and low 30’s with overnight lows even in Phoenix down to a near record low of 75f. We left early at 10am knowing we needed to be on storms early today as diurnal heating would kill off storm chances from around 7pm onwards. 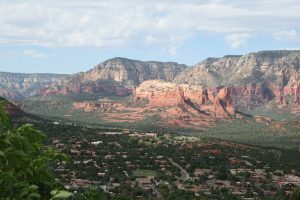 We blasted through Tucson and grabbed a Subway at Benson and then headed east through the Dragoon Mountains and south towards Douglas. We stopped at a great little point near a few farms on open farmland with mountains on both sides of us and the now very organised storm to our south. There was even some decent rotation with this storm for a time and plenty of Cg lightning and structure and even a brief microburst. Pics below of Storm near Douglas. 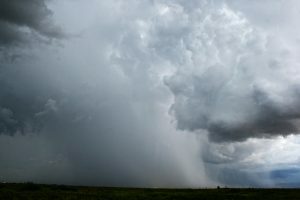 This storm lasted for a good hour or 2 and we did not have to go far for the next storms chances as outflow from the storm above kicked off 3 rapid fire storms South of Wilcox to our North. These were stunning and we got some nice pictures of these. We then moved north again to follow outflow initiating storms and continued to intercept some really decent lightning and structure. It was lovely being in that area with only a few cars seen over the course of a few hours and it is certainly an area I have marked on the map. We continued on towards Benson and back for the evening when storms took a rapid down turn around 6pm hoping to at least see a nice sunset with clouds lit up, but another tiny storm initiated just west of Benson so we found a nice spot and watched and prayed it would drop a Cg bolt like very over storm today. 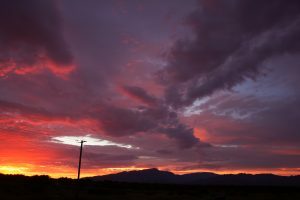 This was the atypical Monsoon Sunset storm with lovely red and pink colours, but it was just not to be this time. Every so often you get a day when everything goes wrong and you think the world is against you, this was one of those days. Of all the chases I have conducted over 15 years this would rank in the bottom 5 of all chases. The first mistake was not doing our usual route down I-10 and take the scenic route towards Globe and then south down the mountain road towards Tucson. 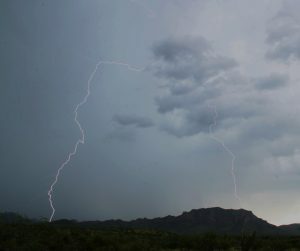 The end result of this was missing some really active storms south of Tucson and getting into the area as those storms were diminishing. The sunset was nice and that was about all for this day or so we thought. As we headed North and back to Phoenix an area of Storms started to erupt over west of the Metro near Buckeye, we came off I-10 near Maricopa and watched a constant stream of Inter Cloud lightning, it was pretty impossible to take any pictures of this. We blasted back to the hotel and everyone got their heads down, I stupidly ran one last look at the HRRR and it showed things kicking off again between 1-3am. I came back to the room and took 1 last look at radar at 115am and nothing of any note was showing, I fell asleep almost instantly and when I looked back in the morning severe storms erupted at 130am. 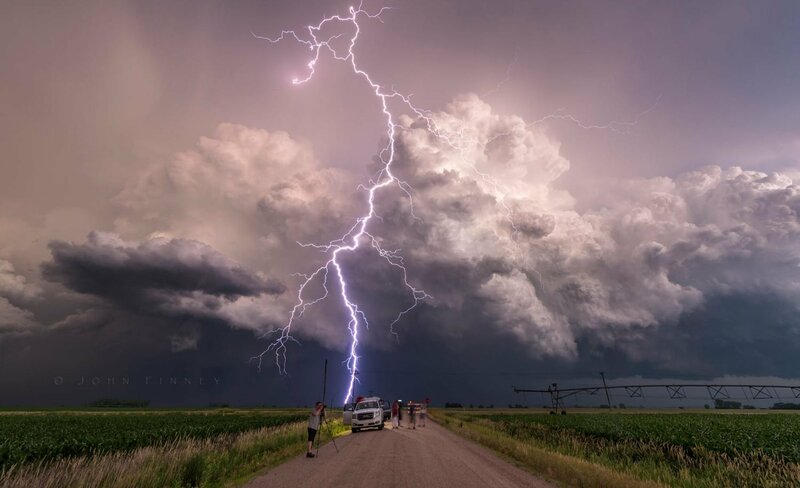 Thats the rub of the green in this game and seeing the pictures on social media the next day of some of the best Cg lightning of the season within 20 miles of your hotel makes you feel sick inside. Par for the course for 2017! 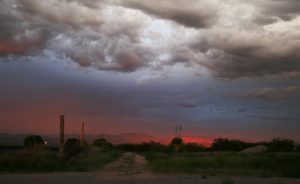 Saturday 12th saw a split risk with 2 zones of storms, the first in SE Arizona and the 2nd across and just north of the Mogollan Rim. 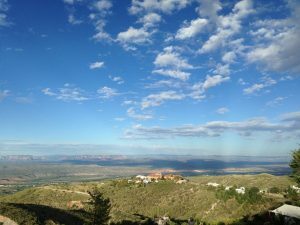 We chose the southern option and set out early for Mount Lemmon. We ate lunch at a nice restaurant in the Ski Village which had hummingbirds floating around the nectar pots and also had a few storms hanging around the mountain with booming thunder whilst we ate. If you get a chance Iron Door is a really nice restaurant and well worth a visit. 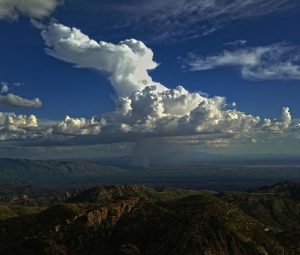 After heading back south we stopped off at Windy Point as new storms were developing south and south east of Tucson and I was wary about getting off the mountain in good time for sunset storms. We followed the storm above east towards the Benson area and shot some nice structure just before sunset. This storm was strong enough to create new storms off of its outflow and just after the above picture was taken I headed south on Highway 90 towards Kitchener Canyon and watched a storm blow up really quickly to our South East, so quickly we could not even get a viewpoint before it had put down 5 or 6 amazing clear air Cg bolts. 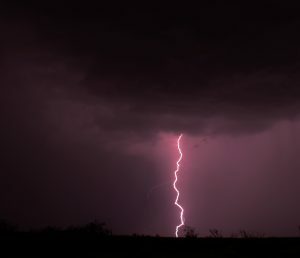 We watched this storm and others in the area for about an hour and managed to get some really nice Night Time Cg bolts. Finally a storm after sunset! 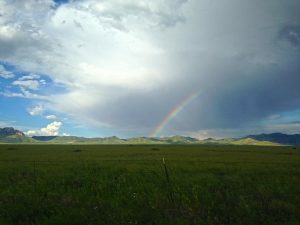 Day 3 of the Monsoon chase saw us targeting a different part of the state namely Northern Arizona where the hot and heat of the deserts is replaced with 6000-8000ft elevations and pine forests and volcanoes and huge canyons. 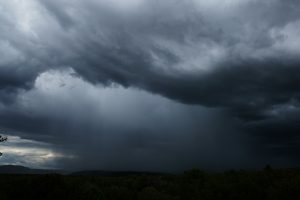 We left early and got onto a developing storm just North East of Sedona, as we were lunching in Flagstaff we gave this little storm about 30 minutes of our time before we pushed onwards. It threw out quite a few Cg bolts and gave us something to break up the long journey. 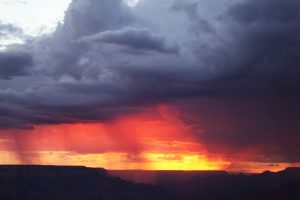 After lunch we continued on towards the Grand Canyon and noticed there were some nice storms just to the North and were hopeful these would continue at least until sunset. 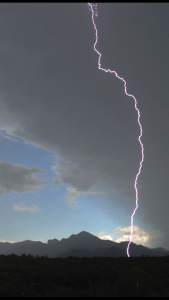 As sunset approached lightning was still visible but now to our North East over the East Rim towards the Page area. 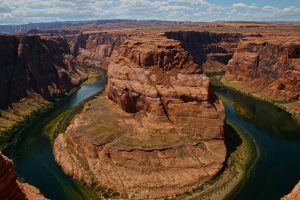 We shot some pictures west at first down the canyon from Lipan Point. 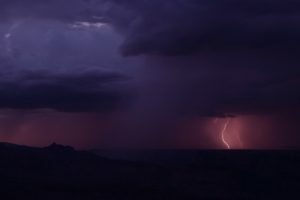 The storm to our North East was easily in shooting distance as it got a little darker so I re-positioned my view East and managed to get some Cg lightning pictures of this pretty storm over the East Rim. Only the 2nd time I have managed to shoot lightning from the Grand Canyon. Our 2nd day of the Monsoon saw us heading South and East once again so it was a carbon copy of Wednesday and an 11am leave towards Tucson. After a quick lunch in Jasons Deli we headed south to a quite strong storm south of Green Valley along I-19. We stopped near Agua Linda Farm at a decent viewpoint overlooking a nice Mountain to our south and shared a dirt road with Arizona Chaser Lori Bailey. 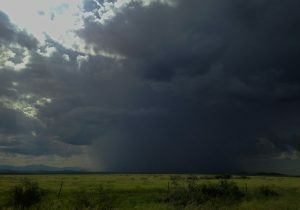 This storm was moving quite quickly for Arizona Standards to the WNW at about 25mph. There was some really nice Lightning with this storm with great colours. 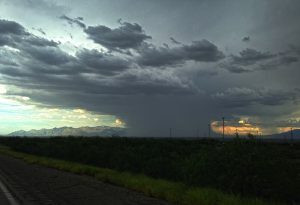 After this storm rumbled its way west towards Organ Pipe we headed back North towards a new storm that was really starting to get strong near Tucson. 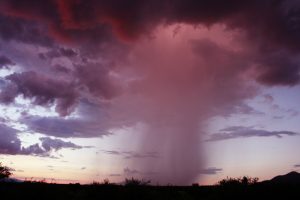 This storm we later learned caused considerable damage over eastern parts of Tucson with a wet microburst ongoing – See Pic below. This storm then continued to head North Westwards towards Marana and started to initiate a small Haboob which we just about kept ahead of. The Interstate started to get a little bit clogged up with blowing dust and after re-fuelling up we went east just south of Picachu Peak and found an amazing little road that would be good for a later date for either Lightning or Astro Photography. As we headed east another storm initiated from the outflow of the haboob ongoing to our west now near Casa Grande. 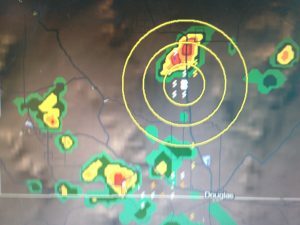 This little storm was situated between Florence and Oracle Junction and spat out a few Cg bolts before dying away before sunset. 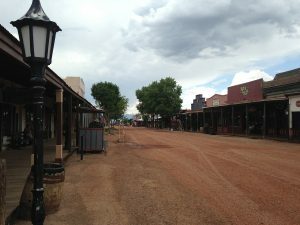 So our first day proper of the Tour saw a chance of Thunderstorms in the SE Arizona area and it was an 11am start to head south down I-10 towards Tucson and a lunch in the historic Old West Town of Tombstone which was the scene of the Gunfight at the OK Corral which featured Wyatt Earp in the late 1800’s. 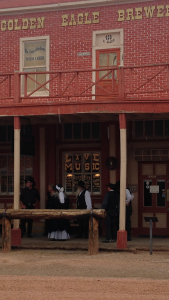 This is always a great place to visit and lunch at the Crystal Palace Saloon was surrounded by loud thunder as a storm initiated just to the South. 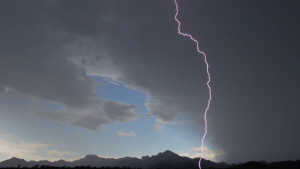 Storms today were quite weak and we followed a few back west towards Tucson before they all weakened before sunset. A nice gentle starter for the Arizona Newbies!